This solution can also display these videos in Full Screen! 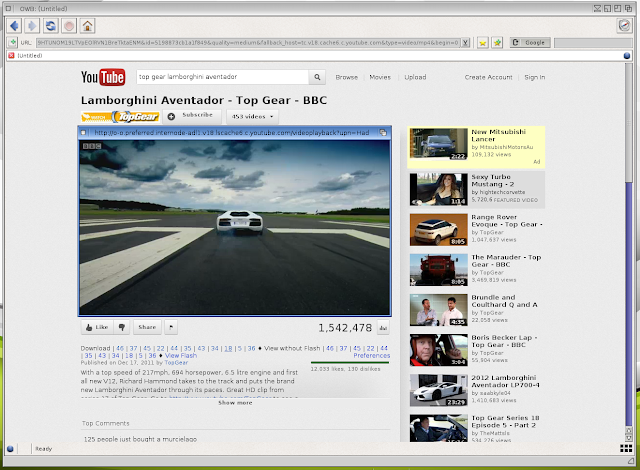 Update 2/04/2014: The latest Odyssey web browser can now display YouTube videos within the browser. Please see my latest blog entry here for more details. The information below is still relevant if using the older MUI-OWB web browser. 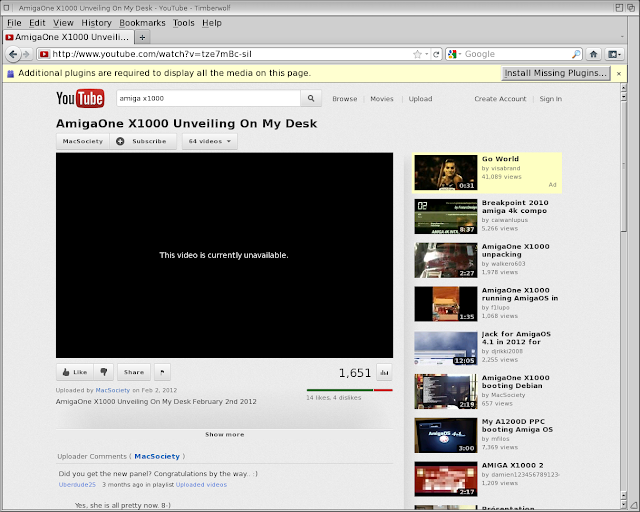 First, some explanation about this YouTube issue on the X1000 and recent developments. YouTube videos do not work on the X1000 using MUI-OWB, OWB, Timberwolf or iBrowse. This is because there is no Adobe Flash support on AmigaOS4 web browsers and YouTube uses Adobe Flash (FLV) to playback most video content on it's website. This also stops playback of Flash content on other websites too. Adobe Flash is proprietary software and Adobe does not support AmigaOS4 so this situation is unlikely to be fixed in the future. Fortunately for us, current Apple iOS devices such as iPad and iPhone do not support Adobe Flash either. 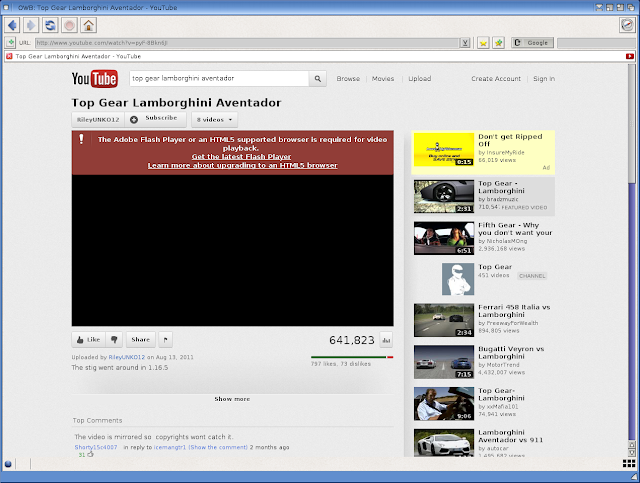 Due to their widespread global popularity YouTube has had to find a solution using HTML5 instead of Flash, to enable non-Flash browsers and Operating Systems to view their video content - which in turn can in the future benefit AmigaOS users using HTML5 enabled web browsers like Timberwolf as well! So having exhausted this possibility as not yet ready for prime time, we now look to MUI-OWB web browser for the solution to watch YouTube videos! 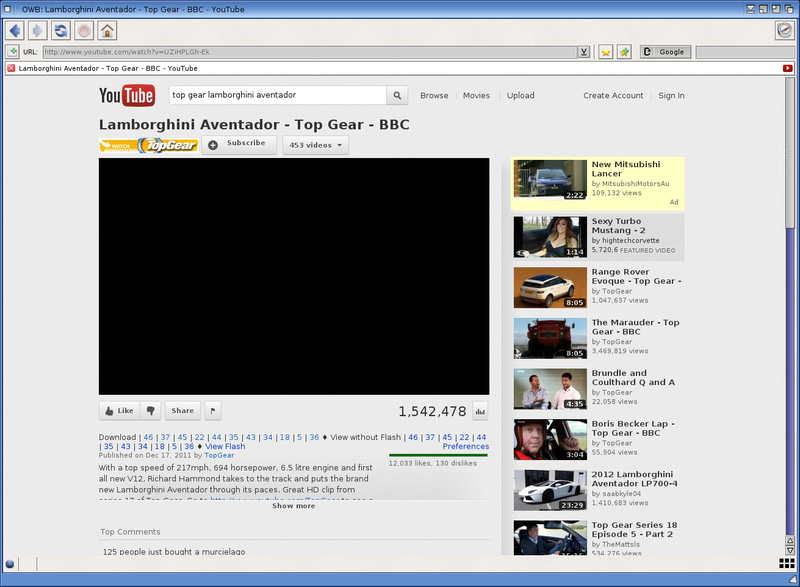 So now I will show you what you need to do to get YouTube videos to play using MUI-OWB! Please note that I am aware of other solutions such as getvideo (using wget, etc), clipdown, tubexx, etc, but all of them are painful to setup and I found the method I am showing below much easier to do and much closer to the YouTube experience people expect when using it on PC or Mac, etc.. In my case, I extracted MUI-OWB to System:internet/muiowb , MUI-Mplayer to System:utilities/mplayer and I put the YouTube.js & YouTube_EZDownload.js file in the System:internet/muiowb/scripts folder. 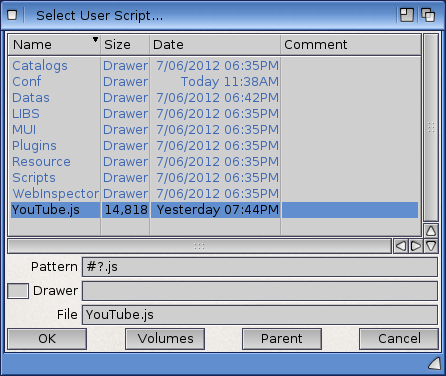 (if you previously put YouTube.js into the main muiowb folder, just overwrite with the newer file. So now we have some configuration work to do. Let's get started! 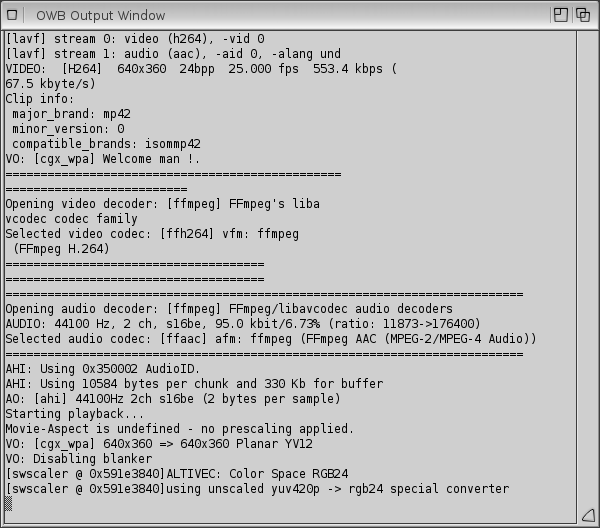 Now, in a previous blog entry here I detailed how to configure MUI-Mplayer to playback videos on X1000. This works well when using the GUI mode of Mplayer, but does not work when using MPlayer through the command line which is what is needed for this. 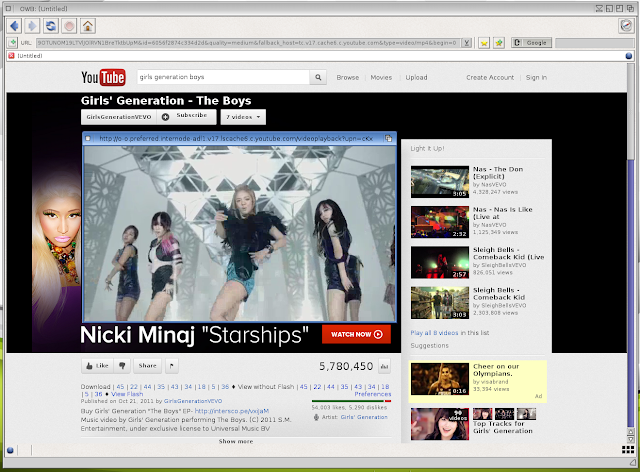 We also need additional optimisations for streaming YouTube internet video content using Mplayer. 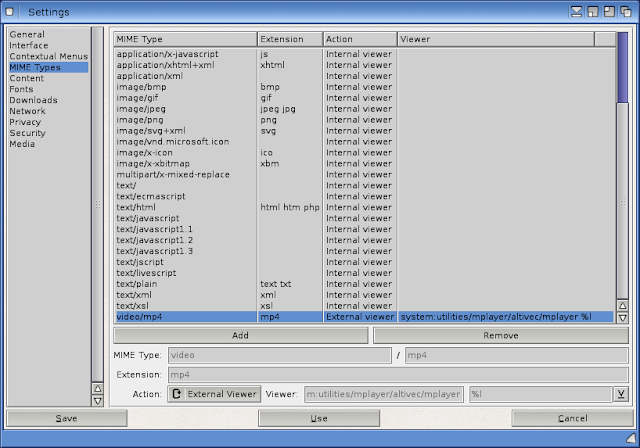 MPlayer uses two separate config files, one for GUI mode (gui.conf), and one (config) for the default options when run on the command line. 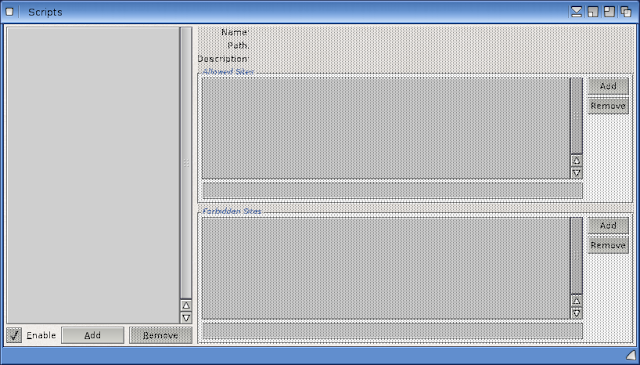 Ok, with that done, we need to do some configuration work in MUI-OWB. So next, run MUI-OWB. Once loaded, right click on the top menu and go into the Settings Menu and select the Preferences option. 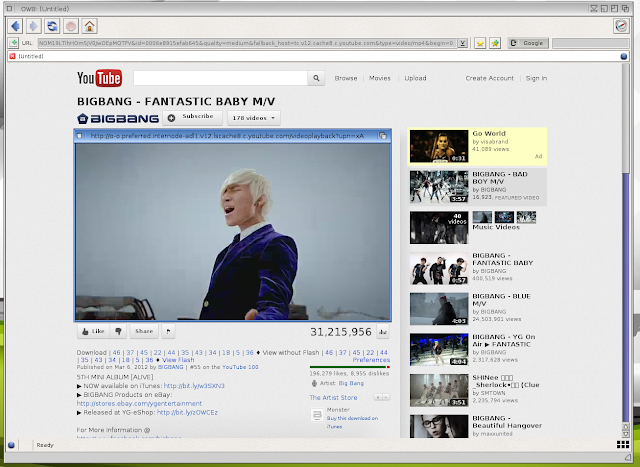 If the new video/mp4 entry looks like the above screenshot, then click on Save. 22/9/2012 Update NOTE: With recent YouTube url changes you need to modify the %l parameter in the screenshot above to be "%l" (with the quotes) or it doesn't work. 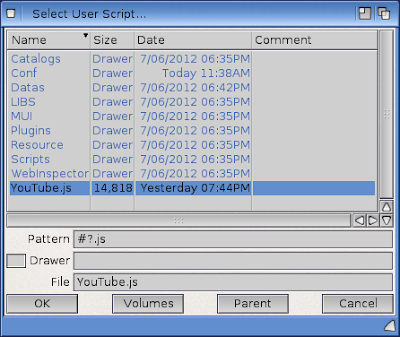 Ok, now we need to add the YouTube.js script into MUI-OWB. What this script does is to provide a extra option list below YouTube videos when visting the YouTube website to allow us to display videos in HTML5 (which doesn't work in MUI-OWB yet) or to Download (Stream) the content to our computer which will work. Click on the Add button, which should then give you a window (like below) to locate the YouTube.js file, and either double click on the file, or click once to highlight it and then click on OK.
YouTube.js script now adds a Download section and View without Flash section below the video with some various numbers as links to click. In our case we have only configured Option 18 (Mp4) under the Download section. If you click on the Option 18 in the download section, you will see the YouTube video running in a window with a Shell window hidden behind it! With the configuration I used, please only use Option 18 to play videos in MUI-OWB. Note: View without Flash section is used for HTML5 video playback within the YouTube website, which MUI-OWB cannot do as yet as it doesn't support HTML5. You can also double click on the video to view it full screen, or double click while full screen to return to the window view. This works well enough for most videos I tested. So I can now watch YouTube videos on my X1000! Finally! As mentioned in another blog entry of my initial review of the X1000, I know that MPlayer cannot play back full HD video content as yet, so YouTube playback using standard MP4 video size (Option 18) is the way to go until the updated Graphics Drivers for the X1000 are released which should fix this and allow streaming of bigger resolutions. I should mention that a small number of YouTube videos I tried had speeded up audio for some reason, but only a few videos seem to be affected by this. Not sure the reason for this though! As a side note if you are interested in the Korean Pop videos I showed here (Recently I am enjoying listening and watching K-Pop music artists) you can view my K-Pop YouTube playlist here! Perhaps in time I will work out how to setup the other video streaming file types in MUI-OWB to play other content but YouTube is the focus here! 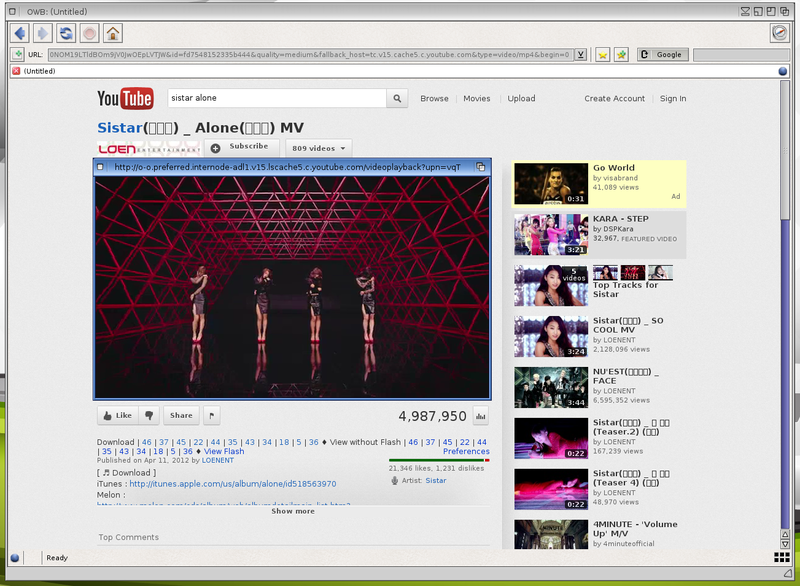 I hope this information is of help to you in viewing YouTube videos on your X1000! Awesome, thanks for the info. 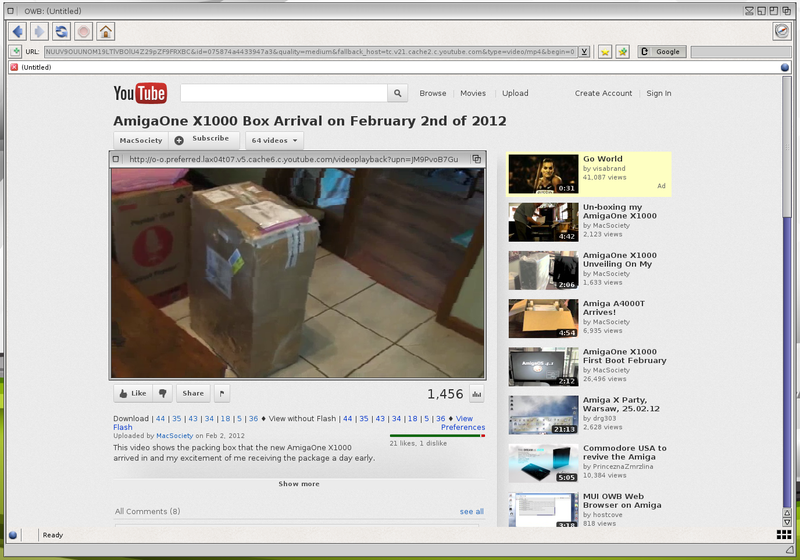 Fantastic, thanks for that, been using getvideo on my sam460 but this seems a more elegant solution for now. Nice tutorial, thanks! Is there a way to make mplayer open on OWB screen instead of WB? Not to my knowledge, sorry. If I find a way to do it I will certainly update this article though! I found a way to do it! You need to edit config file and add PUBSCREEN=screenname after vo_cgx_wpa. Replace screenname with whatever youre is. I tried your suggestion but it didn't work for me - just crashed the mplayer program when clicking Option 18 on a YouTube clip in MUI-OWB. Mui-owb opens a public screen called OWB, so I used the line vo=cgx_wpa::PUBSCREEN=OWB in the config file. What did you use for this? My OWB screen is called Browser so config line is vo=cgx_wpa::PUBSCREEN=Browser. In MUI user interface settings for OWB screen "like workbench" and "compsiting" are enabled. Thanks for this further information! I did change the screen name in MUI preferences in MUI-OWB to Browser (By copying the default Workbench screen and renaming) and then changing the MUI screen settings you mentioned. 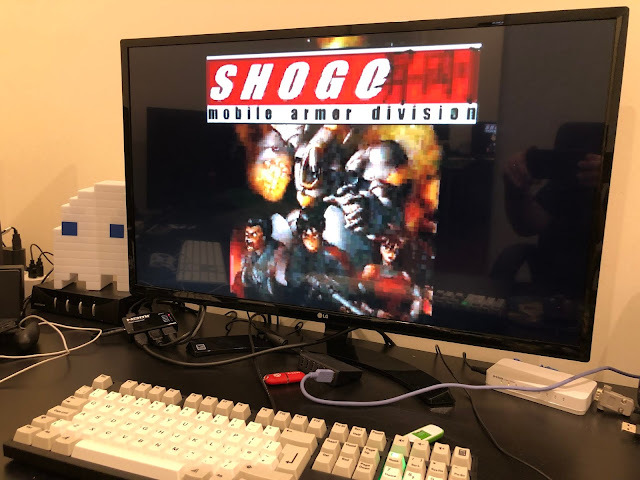 After that, Mplayer YouTube in MUI-OWB works now instead of crashing, and it now opens a window for mplayer on a dedicated separate screen for MUI-OWB instead of the Workbench screen. 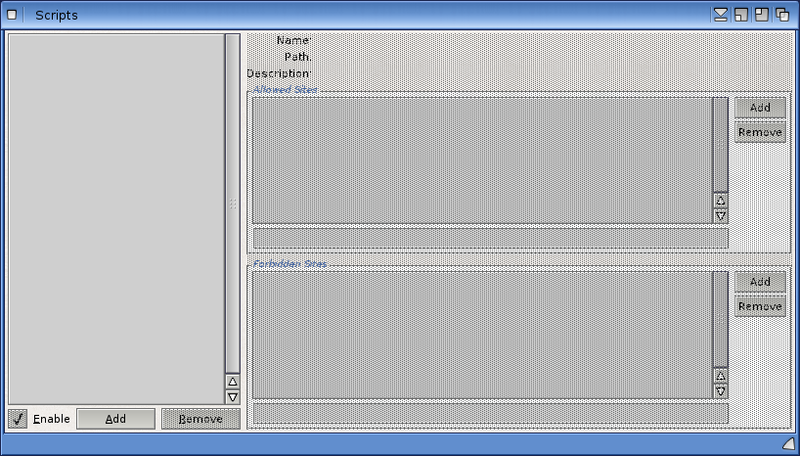 This is useful for those people who like to run MUI-OWB on its own screen rather than on the Workbench screen. Thanks for the tip. 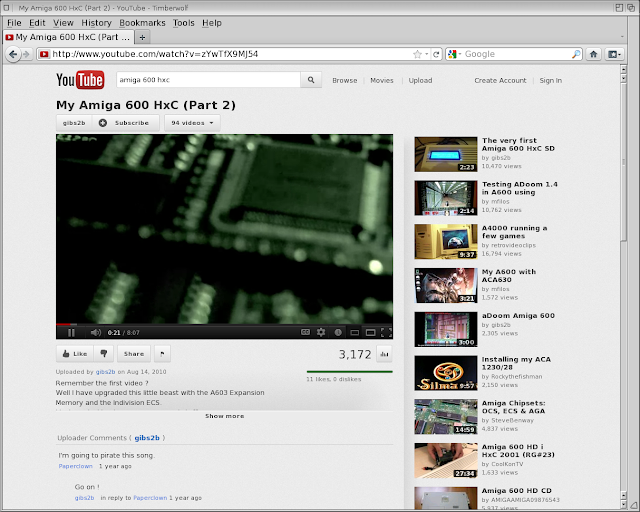 Will 3D support via Gallium speed up HTML5 on AmigaOS? Thanks for the ::PUBSCREEN=Browser tip! 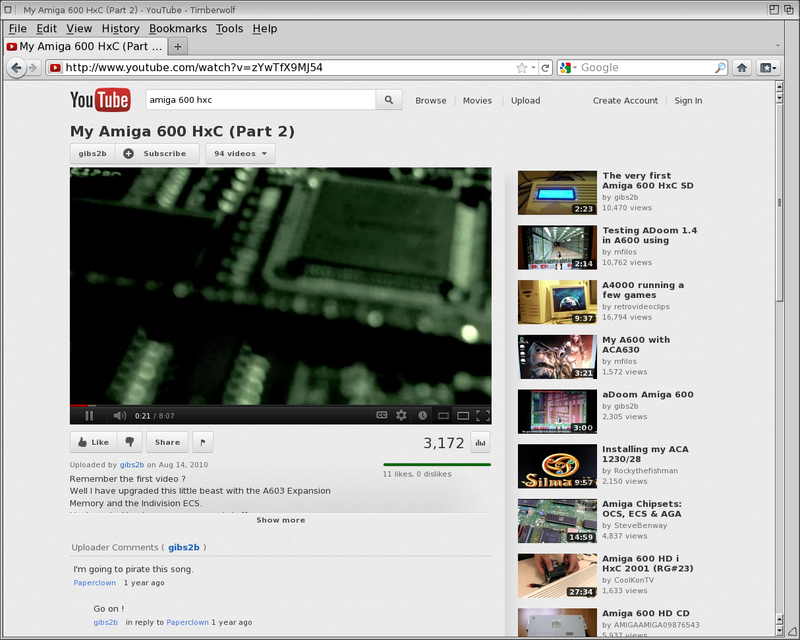 "Will 3D support via Gallium speed up HTML5 on AmigaOS?" I would guess so, but it will probably get speeded-up before then, as currently Timberwolf is not yet optimised at all (e.g. it currently redraws the entire window even if only one pixel changes). no luck with this. I get "server returned 403 forbidden"
I checked and confirmed the link is working ok. I noticed reports on AmigaWorld.net that youtube changed the url paramters recently which means the mime types need to be changed from %l to "%l" or it doesn't work. I have updated the blog entry accordingly. This is what I get when I try to play a video. What am I doing wrong? Thanks for letting me know. Looks like YouTube has changed something and broken the solution I described. I confirmed today that I can no longer stream videos as before using MUI-OWB. I have updated the blog entry to reflect this until I work out how to fix it! Sorry about that but I obviously can't control YouTube website changes! Hi great guide, but I still have problems with it. I've recently, since November, bought an X1000 machine but I have problems with playing YouTube videos, where previously with my Pegasos2 system I hadn't. The problem is that I followed your guide exactly as it says, but when I click on "18" to view without flash nothing happens. Wish I could get this to work on my micro A1 with Odyssey 1.16. First problem is that there is no way to enable HTML5 via the link you provide to the youtube options. There are no selections available and nothing that can be changed on that page. I have tried to spoof every type of browser available for Odyssey and nothing works except ipod, which at least shows me the youtube video pictures with a play button. But there are no buttons underneath as shown in your examples. 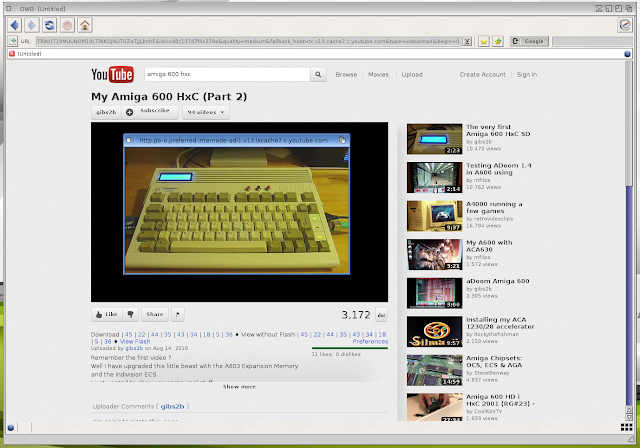 So how is it possible to select HTML5 by default on youtube if it cannot be done by any existing Amiga browsers?